U.S. Cannabis Spot Index down 1.6% at $1,144 per pound. The simple average (non-volume weighted) price decreased by $33 to $1,223 per pound, with 68% of transactions (one standard deviation) in the $460 to $1,987 per pound range. The average reported deal size declined to 3.5 pounds this week from 4.0 pounds last week. In grams, the Spot price was $2.52, and the simple average price was $2.70. 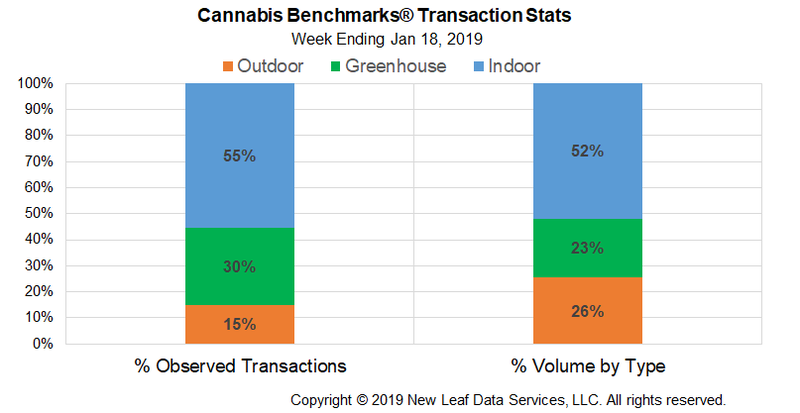 The relative frequency of trades for outdoor flower grew this week, by 1%, while that for greenhouse product decreased by the same proportion. The relative frequency of transactions for indoor flower was unchanged compared to last week. 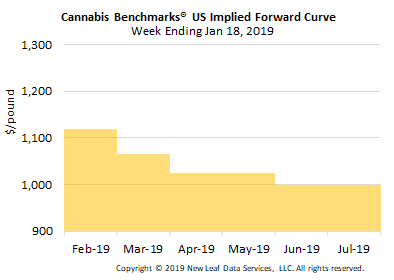 Each grow type’s share of the observed volume traded nationally was virtually unchanged week-over-week. The only shift discernible in the chart below is a less than 1% increase in the relative volume of outdoor product. The U.S. Spot Index decreased for the third straight week, sliding by 1.6% to settle at $1,144 per pound. 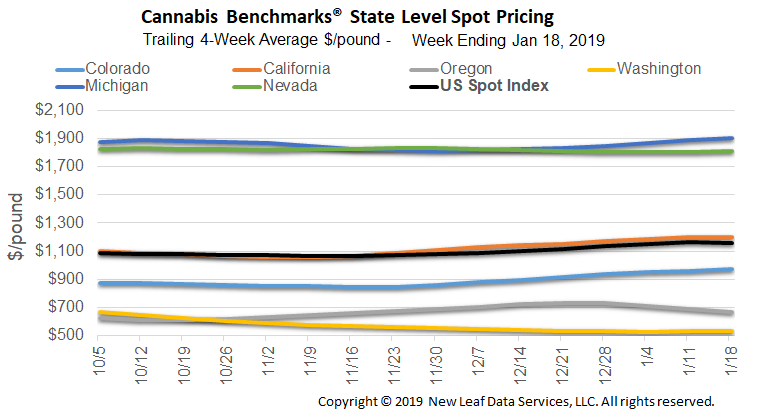 A sizeable week-over-week decline in the national volume-weighted price for outdoor flower was primarily responsible for pushing down the national composite rate, with such product seeing the most notable price erosion in California and Washington State this week. On the state level, Colorado and Washington were the only two major markets to see increases in their Spot rates, and relatively modest ones at that. Meanwhile, the second-tier markets of Arizona, Nevada, and Michigan all saw week-over-week downturns in their composite rates. Prices in Massachusetts continue to rise, as they have since the beginning of adult-use sales in late November, but trading volumes remain relatively small in the young market and have not yet exerted notable influence on the U.S. Spot Index. Three straight weeks of declines have caused the Trailing 4-Week Average of the U.S. Spot to reverse course this week, ending – at least for the moment – the upward trend that commenced in mid-November. 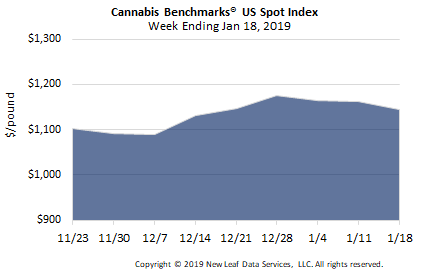 The trend line of California’s Spot Index also saw its positive momentum disrupted this week, flattening compared to last week after rising for a period slightly longer than the national average. Additionally, the Trailing 4-Week Average of Nevada’s composite price changed direction this week, turning upward slightly after sliding gradually from late November through last week. Meanwhile, the trend lines of the Spot Indices of Colorado, Oregon, Washington, and Michigan, remained fairly steady relative to the courses that they were on to close 2018. February 2019 Forward up $20 to $1,120 per pound. * The average reported forward deal size increased nominally to 55.5 pounds. The proportion of forward deals for outdoor, greenhouse, and indoor-grown flower was 55%, 28%, and 16% of forward arrangements, respectively. The average forward deal size for monthly delivery for outdoor, greenhouse, and indoor-grown flower was 62 pounds, 49 pounds, and 43 pounds, respectively. At $1,120 per pound, the February 2019 Forward represents a discount of 2.1% relative to the current U.S. Spot Price of $1,144 per pound. The premium or discount for each Forward price, relative to the U.S. Spot Index, is illustrated in the table below. How Will Hemp Legalization Impact Cannabis Farmers?